Check out the top ten plays from a jam-packed Sunday in the NBA. Andre Drummond scores 23 points with 11 rebounds, Stanley Johnson adds 22 off the bench as the Pistons take it, 124-109. LeBron James records 44 points, 10 rebounds, and eight assists and hits the game-winning triple to put the Cavaliers over the Pacers in Game 5, 98-95. LeBron James led the way with 32 points and 13 rebounds as the Cavaliers beat the Pacers in Game 4. LeBron James posts 27 points, 10 rebounds, and six assists to lead the Cavaliers to a 112-106 Eastern Conference win over the Raptors. Jose Calderon finds Rodney Hood under the basket for the rise and dunk. Jose Calderon catches it inbounds and drills the jumper. LeBron James notches a triple-double with 16 points, 13 rebounds, and 12 assists to help lead the Cavaliers over the Mavericks 98-87. Larry Nance Jr. catches the lob from Jose Calderon and lays it up and in. JR Smith intercepts the pass and Jose Calderon finds him for a reverse jam in transition. Kelly Olynyk scores 19 points and James Johnson adds 15 points and nine rebounds as the Heat defeat the Cavaliers 98-79. Jose Calderon passes underneath to LeBron James for the layup. LeBron James grabs the rebound and throws a ridiculous full-court pass over the heads of everyone that hits Jose Calderon in stride for a breakaway layup. Averaged 11.4 points, 4.7 assists, career-low 1.3 turnovers and 30.5 minutes in 81 games (81 starts)…shot 45.6% (341-748 FGs) from the field, 44.9% (191-425 3FGs) from 3-point range and 82.5% (52-63 FTs) from the line…among NBA leaders, ranked 4th in 3FG% and 31st in assists...1 double-double (point/assist)…4 games with 20+ points…18 games with 15+ points (12-6 record)…56 games with 10+ points (37-19 record)…3 game with 10+ assists (3-0 record)…16 games with 7+ assists (14-2 record)…15 games with 4+ 3-pointers…38 games with 3+ 3-pointers (25-13 record)…season-high (game-high) 23 points (8-13 FGs, 7-10 3FGs), including DAL’s first 11 points of 4th quarter, to go with 4 rebounds, 9 assists and 2 steals in 37 minutes vs. TOR (12/20/13)…left the game at ATL (11/29/13) in 3rd quarter with a right ankle contusion and did not return…missed the game vs. MIN (11/30/13) due to the injury…left 45 seconds into the game vs. BKN (3/23/14) due to a facial injury and did not return. 2012-13 (Toronto/Detroit): Averaged 11.3 points, 7.1 assists and 29.6 minutes in 73 games (58 starts) with TOR and DET…shot 49.1% (312-635 FGs) from the field, league-high 46.1% (130-282 3FGs) from 3-point range and 90.0% (72-80 FTs) from the line…ranked 2nd in the NBA in assist-to-turnover ratio (4.11)…in 45 games (30 starts) with TOR, averaged 11.1 points, 7.4 assists and 28.3 minutes while shooting 47.0% (187-398 FGs) from the field, 42.9% (79-184 3FGs) from 3-point range and 90.4% (47- 52 FTs) from the line…in 28 games (all starts) with DET, averaged 11.6 points, 6.6 assists, 1.1 steals and 31.7 minutes while shooting 52.7% (125-237 FGs) from the field, 52.0% (51-98 3FGs) from 3-point range and 89.3% (25-28 FTs) from the line…2 triple doubles…11 double-doubles…6 games with 20+ points…2nd double-double with 20 points (8-16 FGs, 2-4 3FGs, 2-2 FTs), 17 assists and 3 steals in 50 minutes vs. UTA (11/12/12)…1st triple-double with 13 points (5-10 FGs, 2-2 3FGs, 1-1 FTs), 10 rebounds and 10 assists in 39 minutes at IND (11/13/12)…9 points (3-8 FGs, 2-5 3FGs, 1-1 FTs) and season-high-tying 18 assists in 43 minutes vs. ORL (11/18/12)…2nd triple-double with 18 points (6-12 FGs, 1-5 3FGs, 5-6 FTs), 10 rebounds and 14 assists in 37 minutes vs. HOU (12/16/12)…23 points (10-15 FGs, 3-6 3FGs), 5 rebounds, 6 assists and 2 steals in 33 minutes at CLE (12/18/12)…21 points (9-15 FGs, 3-4 3FGs) and 8 assists in 31 minutes vs. MIL (1/13/13)…22 points (9-15 FGs, 1-4 3FGs, 3-3 FTs) and 9 assists in 30 minutes vs. LAL (1/20/13)…23 points (10-13 FGs, 3-4 3FGs), 5 rebounds, 10 assists and 3 steals in 35 minutes at MIL (2/9/13)… season-high 24 points (9-17 FGs, 6-9 3FGs) to go with 5 rebounds in 37 minutes vs. WAS (2/13/13)…season-high-tying 18 assists to go with 6 points (2-6 FGs, 2-2 FTs) in 36 minutes at WAS (2/27/13)…10 points (4-10 FGs, 1-4 3FGs, 1-1 FTs) and 16 assists in 40 minutes vs. NY (3/6/13)…19 points (8-12 FGs, 1-2 3FGs, 2-3 FTs) and 9 assists in 43 minutes at TOR (4/1/13). Averaged 10.5 points, a team-high 8.8 assists, and 33.9 minutes in 53 games, all starts … Assist average ranked fourth in the NBA, while he topped the league in assist/turnover ratio at 4.50 … Paced the team in assists on 45 occasions and finished first on the club with 11 double-doubles … Recorded 10 or more assists in 22 games … Led the team at .882 (60-68) accuracy at the charity stripe … Missed the final seven games (Apr. 13-26) due to a right eye injury and DNP-CD … Left the Apr. 11 game vs. Philadelphia at the 4:56 mark of the third quarter and received three stitches to close a cut above his right eye … Scored a team-best 19 points Apr. 8 at Oklahoma City … Did not dress Apr. 6 vs. Cleveland due to a swollen right eye … Exited with 5:21 remaining in the second quarter Apr. 4 at Philadelphia after taking an inadvertent elbow to his right eye; returned to start second half with four stitches to close the wound … Dished out 10+ assists in seven of eight games, averaging 11.1 (Mar. 23 – Apr. 4) … Logged a season-high 45 minutes Mar. 24 at Chicago … Missed five straight games due to a sprained right ankle (Mar. 11-16) after sustaining the injury at the 3:49 mark of the second quarter Mar. 10 at Detroit … Totaled 17 points and 12 assists March 7 vs. Houston … Averaged 12.0 points and 9.4 assists in February … Matched career high with eight defensive rebounds Feb. 22 vs. Detroit … Led the team with 25 points Feb. 14 vs. New York, marking the fourth time in his career he’d recorded back-to-back games of 20+ points … Set career highs for points (30) and field goals (13) Feb. 12 vs. L.A. Lakers … Became the second player in team history to have 14+ assists without a turnover Feb. 10 vs. Boston (Stoudamire, 1997) … Set season highs with 17 assists and eight rebounds Feb. 3 vs. Washington … Dished out 10+ assists three straight games (Jan. 1-4) … Recorded his 3,000th assist Jan. 1 at Orlando … Opened season with a double-double (15 points, 11 rebounds) in a win at Cleveland, Dec. 26. Missed seven of the last eight games (Apr. 2-13) due to a sore left hamstring … Averaged 9.8 points, 8.9 assists and 30.9 minutes … Ranked fifth in the NBA in assists (8.9) and second in assists-per-turnover at 4.09 (605-to-148) … His assist average tied his career best (8.9) … Set a franchise record with seven games of 15 or more assists … Ranked second on the team in double-doubles (12) and steals (81) … Led the club in assists in 60 of his 68 games … Averaged a team-high 8.1 assists along with 11.0 points during 14 games in March … Tied or led the team in assists 24 straight games (Jan. 26 - Mar. 18) … Scored a season-best 22 points Mar. 1 vs. New Orleans … Grabbed a team-high eight rebounds Feb. 27 vs. Dallas … Averaged 7.0 points and 11.4 assists during 11 games in February … Recorded 10+ assists in a career-high six consecutive games (Feb. 9-23) … Matched a franchise record with 19 assists Feb. 4 vs. Minnesota … Tied a careerhigh with nine rebounds Jan. 29 at Minnesota … Finished with 14 points and 13 assists in a season-high 42 minutes Jan. 22 at the Heat … Matched a then season-high with 21 points and tied a career-high with nine rebounds (with a career-best eight defensive boards) Jan. 15 at Washington; also posted a game-high 15 assists with only one turnover against the Wizards … Recorded 10+ assists in six of seven games (Dec. 17 – Jan. 5) … contributed a then season-high 17 assists in 38 minutes Jan. 5 at Cleveland … Did not play Jan. 4 at Chicago due to a sprained right ankle … Did not dress Dec. 28 at Dallas with a sore left foot … Provided 20 points and a game-high 12 assists Dec. 19 vs. the L.A. Lakers … Returned to the lineup Dec. 17 vs. New Jersey and had 15 points and 14 assists after missing four games with a sore left foot (Dec. 10-15) … Dished-out 15 assists Dec. 3 vs. Oklahoma City … Scored 10+ points in five consecutive games (Nov. 17-26) … Made his first start of the season Nov. 21 vs. Boston … Averaged 7.6 points, 5.4 assists and 21.6 minutes in 13 games off the bench (Oct. 27 - Nov. 19) … Recorded a team-high seven assists off the bench on opening night Oct. 27 vs. New York. Averaged 10.3 points and 5.9 assists in 68 games ... Ranked third in the NBA with 4.08 assists per turnover and tied for 12th in assists (5.9) ... Averaged 10.3 points and 6.3 assists in 39 games as a starter ... Dished out 52 assists, compared to just seven turnovers during eight games in April ... Recorded 11 assists Apr. 12 at Detroit ... Earned his third double-double Apr. 9 at Atlanta with a game-high 10 assists and 10 points …Had 16 points and 10 assists for his second double-double Apr. 3 at Philadelphia … Averaged 10.3 points, 6.0 assists and shot .469 (61-for-130) from the floor during 15 games in March … Made his 23rd start of the season Mar. 17 against the Hawks and first since Dec. 5 at Chicago ... Recorded season highs of 24 points and 12 assists Mar. 13 at Golden Statefor his first double-double ... Placed on the inactive list Mar. 1 at Houston with a laceration on his right elbow ... Returned to action Feb. 7 vs. Sacramento after missing one game with a sprained right ankle ... Placed on the inactive list with a sprained right ankle Feb. 3 vs. New Jersey ... Left in the fourth quarterFeb. 2 at Indiana with a sprained right ankle ... Led the bench with 21 points Jan. 15 at New York ... Returned to the lineup Jan. 6 at Orlando after missing 10 consecutive games (Dec. 13 - Jan. 3) with a sore left hip ... Placed on inactive list Dec. 13 vs. Houston with a sore left hip ... Returned to the lineup Dec. 11 vs. Atlanta ... Played seven minutes in the first half against the Hawks before aggravating the injury ... Placed on the inactive list Dec. 8 vs. Minnesota with a sore left hip ... Had a career-high streak of 124 consecutive minutes without a turnover end during the third quarter Dec. 4 at Washington … Scored a then season-high 21 points on 8-of-11 from the field Nov. 24 vs. Indiana ... Recorded his 2,000th career assist in the first quarter Nov. 9 at San Antonio ... Had 18 points and six assists Nov. 11 vs. Chicago ... Recorded a game-high nine assists and 13 points Nov. 9 at San Antonio ... Scored 16 points on 6-of-11 shooting Nov. 6 at New Orleans ... Recorded a game-high 11 assists during the season opener Oct. 28 vs. Cleveland. Averaged career highs of 12.8 points, 8.9 assists (fourth in the NBA) and 34.3 minutes in 68 games (all starts) … Shot an NBA all-time single-season record .981 (151-for-154) from the foul line … Led the NBA in assist-per turnover ratio (4.21) for the second consecutive year … Paced the team in assists 58 times … Had 28 games with 10 or more assists … Registered 22 double-doubles, second on the team … Missed 14 games with a strained right hamstring … Dished a franchise high-tying 19 assists and scored 21 points Mar. 29 vs. Chicago … Became the all-time franchise leader in assists (1,795) Mar. 13 vs. Detroit in logging a 20-point, 11-assist game … Recorded 16 assists Mar. 3 at Houston … Missed the second of two free throws Jan. 30 vs. Milwaukee, ending a team-record streak of 87 consecutive free throws dating back to last season - the second longest streak in NBA history … Passed Mahmoud Abdul-Rauf for second all-time in consecutive made free throws by going four-for-four Jan. 23 at Chicago … Missed 10-of-11 games between Jan. 4-21 with a strained right hamstring … Registered 16 assists and 21 points Dec. 29 at Golden State … Had a perfect shooting game connecting on eight-for-eight from the field, five-of-five from three-point range and one-for-one at the charity stripe to finish with 22 points Dec. 14 vs. New Orleans … Tied Chauncey Billups’ team record of 51 consecutive free throws Dec. 9 at Cleveland and broke the record Dec. 10 vs. Indiana … Recorded his 1,500th career assist Dec. 5 at Utah … Posted season highs in points (26) and minutes (44) Nov. 21 vs. New Jersey … Missed his first game since March 21, 2007 (104 games) due to a strained right hamstring Nov. 16 vs. Miami … Set a career-high with nine free throws Nov. 5 vs. Detroit … Scored a game-high 25 points and added a game-best nine assists Nov. 1 at Milwaukee … Registered first double-double of the season with a game-high 16 points and 13 assists Oct. 31 vs. Golden State. Averaged 8.7 points and 5.0 assists, second on the team, in 77 games, with 11 starts … Averaged 13.3 points, 8.8 assists and 33.4 minutes as a starter … Ranked fourth in the NBA with a 3.52 assist per turnover ratio (387 assists, 110 turnovers) … Recorded double figures in points in 30 games … Had nine games with 10 or more assists … Had seven double-doubles on the season … Upped his field goal percentage to .521 (263-505) from .423 (132-312) in 2005-06 and his three-point percentage from .163 (7-43) to .333 (25-75) … Returned to action Mar. 23 vs. Denver after missing three games with a sprained left ankle … Had a stretch of four double-doubles in five games Jan. 27 – Feb. 7 … Averaged 14.2 points, shooting .607 (54-89) from the field, and 9.0 assists over a 10-game stretch from Jan. 17 – Feb. 7 … Had a season-high 24 points with 11 assists Jan. 31 vs. Washington … Doled out a team-best 12 assists and added 16 points Jan. 9 at New Jersey … Posted his first double double of the season (12 points, 12 assists) Jan. 5 vs. Atlanta … Equaled his season-high with 12 assists against the Hawks … Made first start of the season Dec. 30 at Memphis, registering 13 points to go with three assists and three rebounds …Returned to the lineup Dec. 22 at Portland, missing two games, after he left the Dec. 17 game vs. Golden State in the fourth quarter after suffering a contusion in his left lower back … Playoffs: Averaged 13.0 points, 5.3 assists (second on the team) and 30.5 minutes (third) in six appearances vs. New Jersey … Had 12 points on a perfect six-of-six shooting from the field in Game 2 … Contributed team highs of 25 points (most ever by a Raptors reserve) and eight assists in a Game 5 win at Air Canada Centre. Averaged 5.5 points, 2.3 rebounds, 4.5 assists (second on the team) and 23.2 minutes in 64 games, including 11 starts … Averaged 9.0 points, 4.5 rebounds, 7.5 assists and 1.4 steals in his 11 starts … Led the team in assists 28 times … Finished with second-most assists for a rookie in team history (288) … Recorded double figures in points on 10 occasions and in assists five times … Had two point/assist double doubles … Led the team in free-throw percentage at .848 (78-92) … Finished third among rookies in free-throw percentage, 10th in steals (0.66) and ninth in minutes … Ranked 14th in the league in assists-to-turnover ratio (2.85) … Played in just seven of the final 20 games due to injury and DNP-CDs … Scored 10 points, including a career-high eight-for-eight from the charity stripe, Apr. 19 at Chicago … Recorded a team-high nine assists Apr. 14 vs. Detroit … Designated inactive for 10 games (Mar. 15-29 - left Achilles tendinitis, Dec. 30, Jan. 3, 4 - sore right heel and Dec. 18-19 - bruised right heel) … Scored 11 points to go with a game-high seven assists Feb. 21 at Memphis … Registered 13 points, four rebounds and a team-best 10 assists for the second double-double of his career Jan. 15 vs. New York … Tallied 15 points, a game-high tying 11 assists and seven rebounds en route to the first double-double of his career Dec. 16 vs. Golden State … Scored eight points and recorded career highs of nine rebounds and 13 assists in 41:34 minutes Dec. 6 at Washington … Recorded 12 assists Nov. 13 vs. Seattle … Registered seven assists in 17:29 without attempting a shot Nov. 7 vs. Cleveland … Posted a game-high 10 assists Nov. 5 at Detroit … Recorded a season-high 20 points (6-8 FG) Nov. 4 vs. New Jersey. Played six seasons in the Spanish pro leagues, including 2001-05 with Tau Cerámica Saski Baskonia Vitoria, averaging 10.9 points, 2.2 rebounds and 2.0 assists in 214 games…competed for Tau Vitoria in three Euroleague campaigns where he averaged 9.0 points, 2.5 rebounds and 2.1 assists in 58 games…helped Spain to the 2006 FIBA World Championship title, averaging 7.2 points, 3.2 assists and less than one turnover per game. SUMMER 2013: Helped Spain win bronze at EuroBasket 2013 in Slovenia...averaged 8.2 points, 2.4 assists and 21.5 minutes in 11 games. SUMMER 2012: Garnered a silver medal as part of Spain’s national team at the 2012 Olympics in London…in 8 games, averaged 7.0 points, 2.1 rebounds and 2.5 assists while shooting 55.6% from the field, 33.3% from 3-point range and 75.0% from the line. SUMMER 2011: Averaged 5.9 points, 3.2 rebounds, 2.7 assists and 1.6 steals for Spain at the European Championships in Lithuania…shot 56.7% from the field. SUMMER 2010: Injured his hamstring and missed the 2010 FIBA World Championships. SUMMER 2008: Was a member of Spain’s silver medal team at the 2008 Olympics in Beijing…averaged 7.3 points and 3.0 rebounds in 6 games. SUMMER 2007: Averaged 12.3 points, 2.1 rebounds, 2.6 assists and 1.2 steals in 9 games at the European Championships in Spain. SUMMER 2006: Helped Spain to the 2006 FIBA World Championship title, averaging 7.2 points, 3.2 assists and less than 1 turnover per game. 2004-05: In 39 regular season games with Tau Cerámica, averaged 12.4 points, 2.6 rebounds and 3.0 assists while shooting 56.7% (114-201 FGs) from the field and 82.3% (107-130 FTs) from the line…scored a season-high 21 points in back-to-back games vs. Ulker and Pau-Orthez…finished 2nd in the Euroleague Final Four, losing to Maccabi Tel Aviv in the championship game…averaged 14.5 points and 3.5 rebounds in 2 games during the Final Four…defeated Benetton in the semifinals and averaged 9.5 points and 5.0 rebounds in the 2-game series. SUMMER 2004: Was a member of Spain’s 2004 Olympic Games entry. 2003-04: Won the 2004 Spanish National Cup (King’s Cup) with Tau Cerámica…averaged 8.0 points, 2.6 rebounds and 2.0 assists in career-high 41 regular-season games…shot 59.2% (87-147 FGs) from the floor…averaged 7.2 points and 2.0 assists in 19 Euroleague games. 2002-03: Captured a silver medal with the Spanish National Team at the 2003 European Championship…played behind former NBA guard and European League star Elmer Bennett at point for most of the season for Tau Ceramica, but minutes increased after Bennett was sidelined by injury… averaged career-high 17.5 points while shooting 85.7% (72-84 FTs) from the line…in Euroleague action, averaged 7.5 points and 2.4 rebounds while shooting 40.5% from 3-point range…18 points vs. Panathinaikos…6 assists without a turnover in 30 minutes vs. Zalgiris Kaunas. SUMMER 2002: Named to Spain’s National Team for the 2002 World Championship of Basketball in Indianapolis. 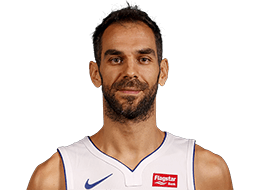 2001-02: After switching to Fuenlabrada in the ACB, saw his playing time curtailed to 18.6 minutes per game…averaged 9.7 points and 1.7 assists while shooting 83.2% from the line. 2000-01: In his ACB debut for Lucentum Alicante, averaged 8.6 points and 25.3 minutes to help his club to the ACB championship. SUMMER 2000: Captured the bronze medal with Spain at the 2000 European Under-20 Championship. 1999-00: Played in the LEB (lower division) for Lucentum Alicante and averaged 9.0 points and 2.1 rebounds. SUMMER 1998: Won the gold medal at the 1998 European Junior Championship. Full name is Jose Manuel Calderon Borrallo…last name is pronounced “CALL-der-own”…born Sept. 28, 1981, in Villanueva de la Serena, Spain…visited Zambia in August as part of UNICEF Zambia education, water and sanitation programs...is an athlete ambassador for Right To Play, an international organization that uses specially-designed sport and play programs to improve health, build life skills, and foster peace for children and communities affected by war, poverty and disease…captured the bronze medal with Spain at the 2000 European Under-20 Championship…won the gold medal at the 1998 European Junior Championship...owns a pig farm in Spain...is a fan of Real Madrid football club.